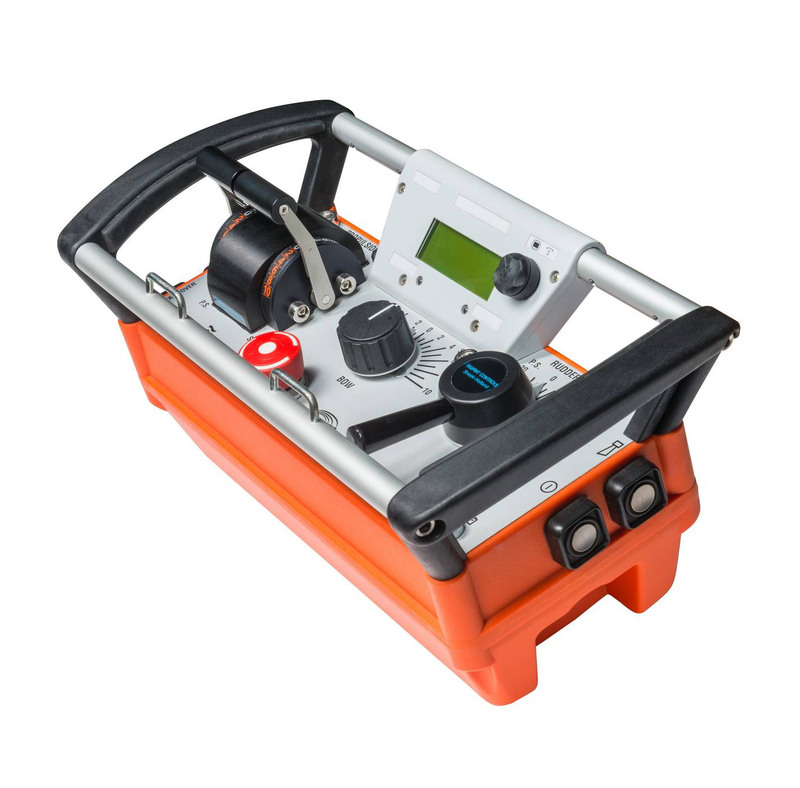 The wireless portable remote control system is a smart and convenient alternative for fixed additional control stands, thus replacing e.g. bridge wing or fly bridge consoles. Saving considerably on building costs & mounting space. It comes with a back-up cable of 20m length that can be simply plugged in on transmitter- and receiver sides, as alternative forthe wireless transmission . DECT based wireless technology, providing 240 channels. Automatic selection of free channel. DECT communication is a registered system only accessible for authorized participants. Unique worldwide address coding to identify transmitter / receiver combination. Redundant diversity control by 2 processors each for transmitter and receiver. Engine alarm lead to vibration of the portable transmitter and generates an acoustic signal while displaying the specific alarm. Presentation of battery status + pre announcing of empty battery. Presentation of RSSI radio signal strength indication. 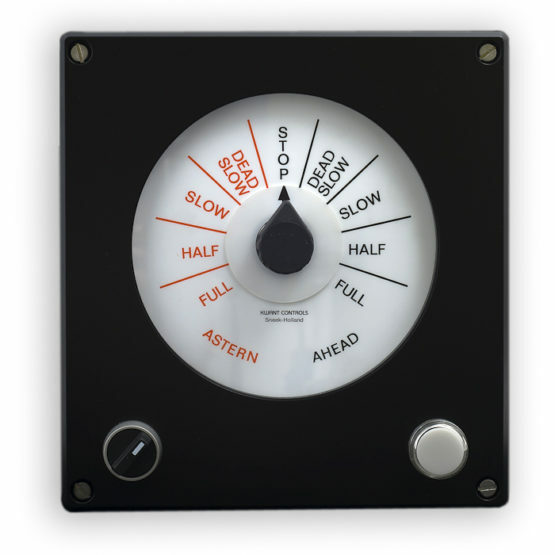 Out of range or excessive tilting will activate alarm at the Wheelhouse and will set signals to “zero”. 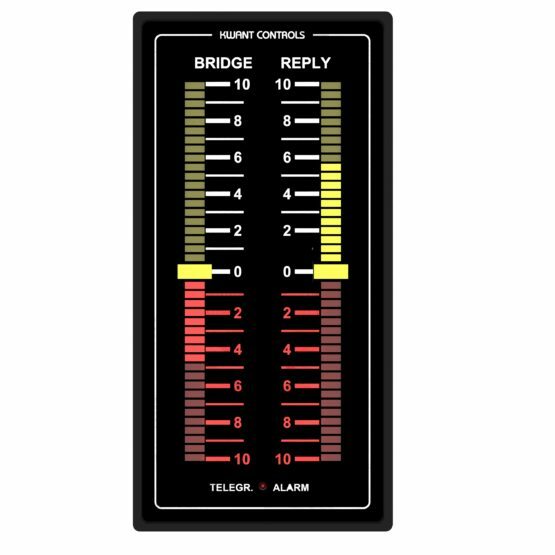 Emergency stop button sets signals to “zero” and activates alarm at the Bridge. Control can be taken over at the Wheelhouse any time. Portable take over only allowed with all controls in neutral position. Power supply portable transmitter with NIMH rechargeable battery (operating time approx. 20 hrs continuous operation). 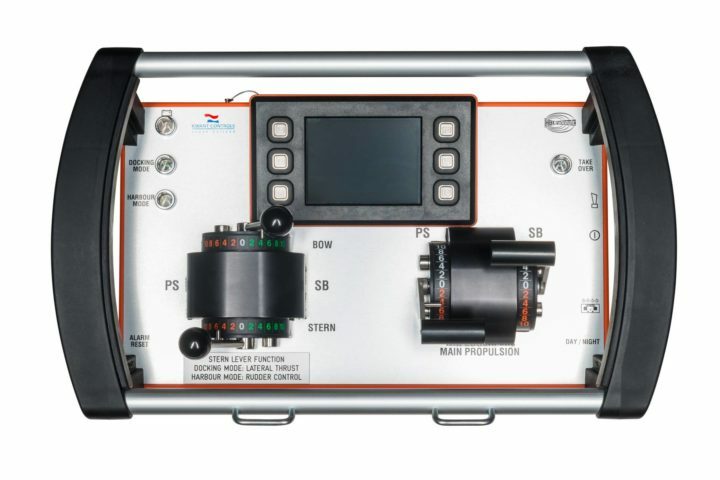 The wireless remote control system is approved by DNV-GL and LRS. 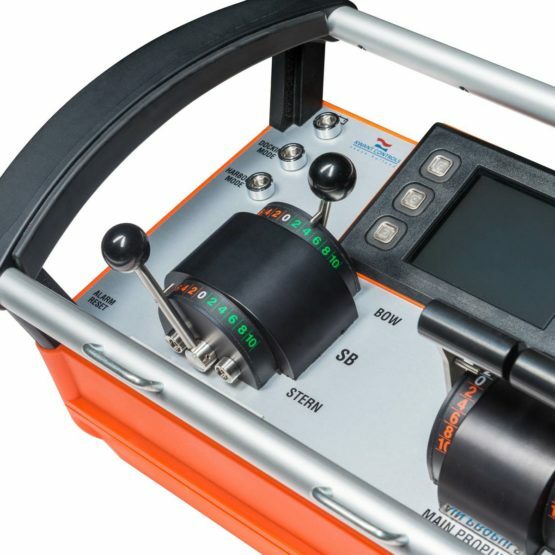 Presentation of shaft rpm, Rudder, thrusters position and relevant engine alarms on an LCD display by means of analogue or digital (bar graph) indication. CAN-Bus / Profibus / device net, RS232 or RS 485. Receiver with integrated or external active antenna with data cable (L = 5-50m). 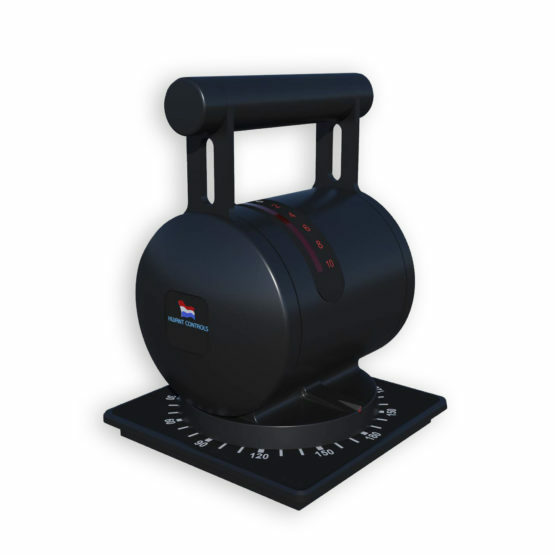 The “Norm” type telegraph has been designed to be used on board of all types of vessels having a remotely controlled propulsion control, and serve as the back-up communication system in case the remote control system should fail. 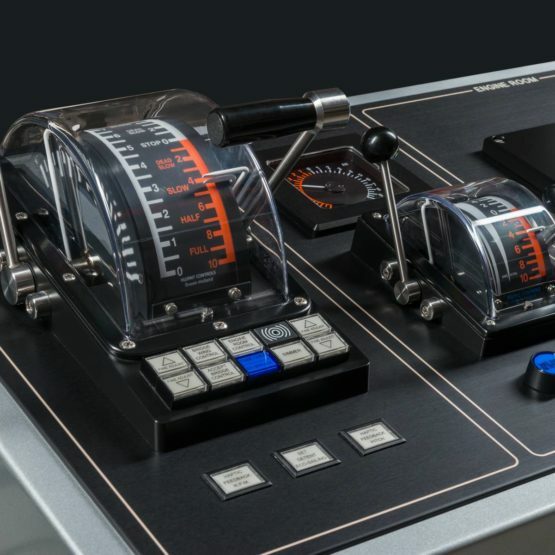 The wheelhouse and engine control room telegraphs are console mounted, IP42, 144x144mm devices, and have a stainless steel housing and a non-reflective black finish. An IP56 housing is available for bulkhead mounting applications such as the Engine Room. 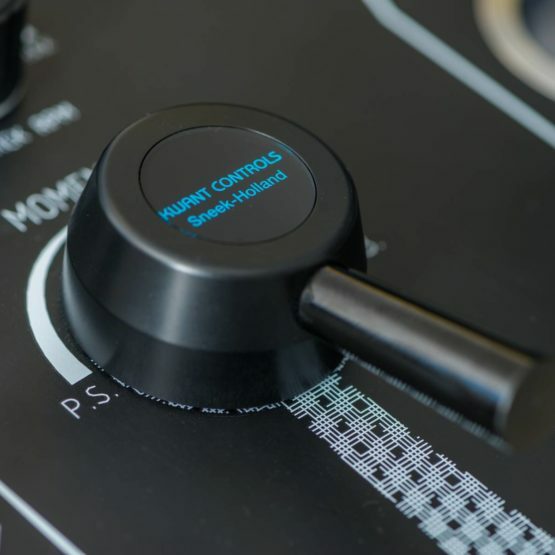 The BUK-C is the second largest console mounted propulsion control lever unit of the BUK-series, with a well-recognized, widely applied and much appreciated timeless classic appearance. 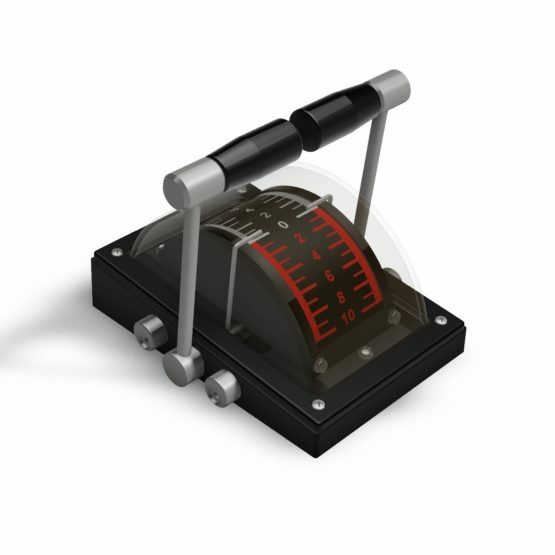 The lever unit comes in a number of variations for user- and machinery interfaces. 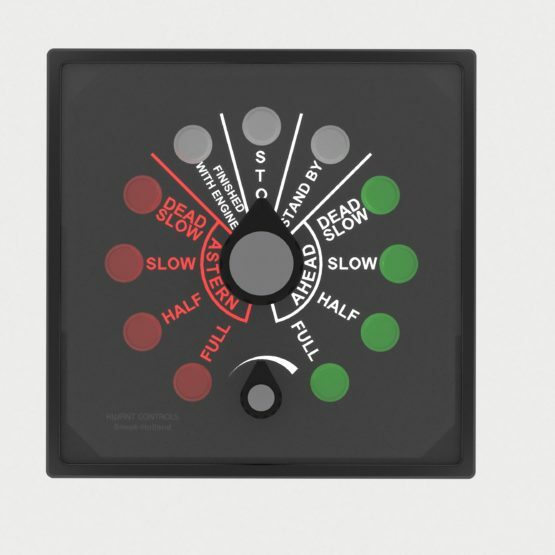 In the BUK-C extended version, a maximum of four HMI pushbuttons/buzzers/signal lamps/dimmers can be incorporated, as well as a wide range of electrical machinery interfaces. The BUK-C special version, is typically suitable for transverse thruster control. 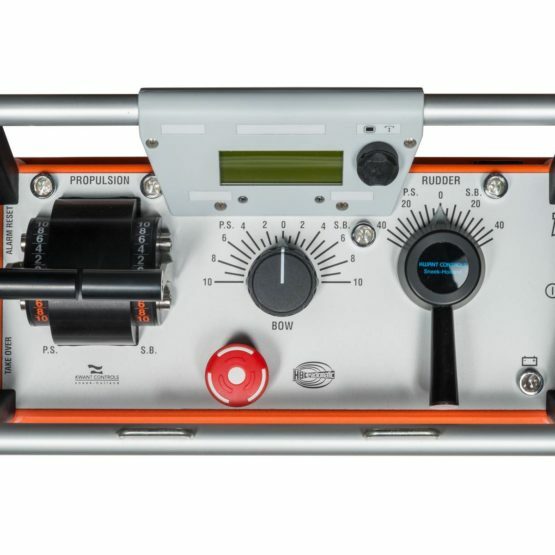 The control units of the types BUK-B, BUK-C and Pointer WD can be supplied with an analogue integrated emergency telegraph system of the ‘pointer’ type. The BUK-B in the twin lever execution can be equipped with twin pointer telegraph systems, whereas the BUK-C only has room for a single system. 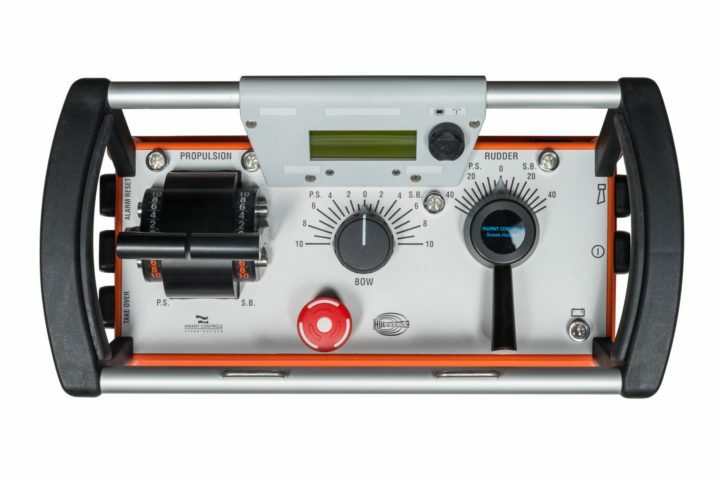 The pointer telegraph is a communication system designed to send orders from the bridge or bridge annexes to the engine room or engine control room. Whenever a new command is being issued, the telegraph alarm will be switched on. In order to mute the alarm, the command must be acknowledged at the selected position by moving the control lever to the position requested. Precision potentiometers are used to transmit the orders. DC servo motors (RSM4) are used for moving the pointers along the scales of the control units. The system can be switched from telegraph mode to Remote Control (RC) mode by means of a single contact. In RC mode, the telegraph alarm is disabled. 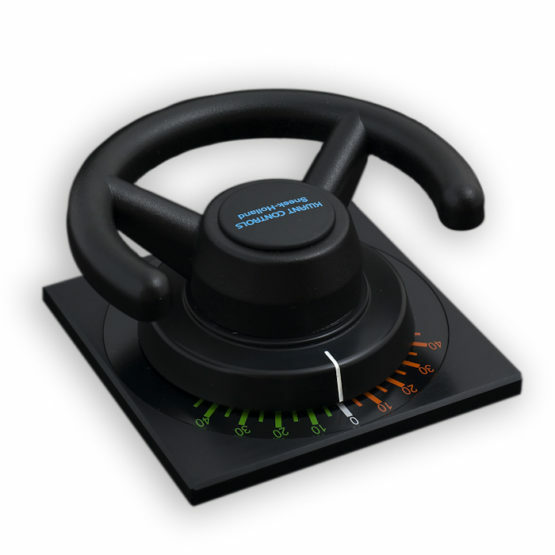 The wheelhouse unit’s reply pointer is now connected to its own command lever. 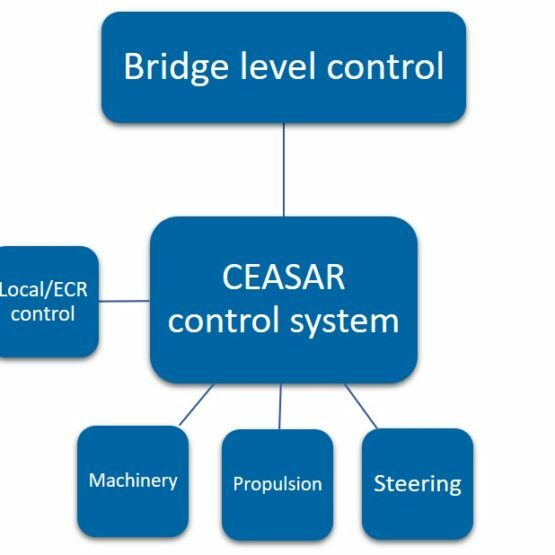 RC mode is used to control the main engine directly from the wheelhouse by means of signal transmitters e.g. a potentiometer or 4-20mA module. 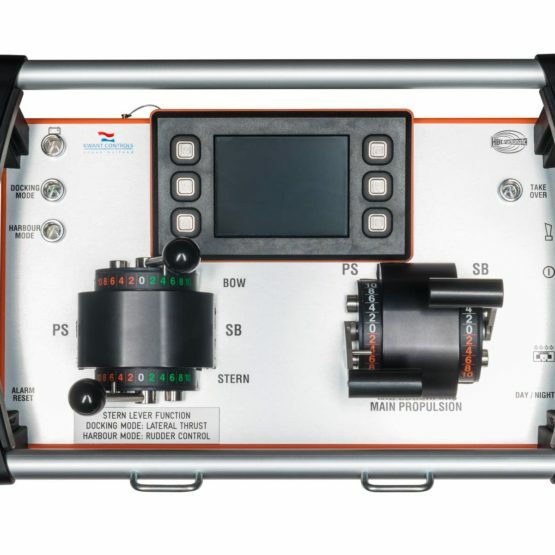 The Kwant Controls levers are primarily used for electronic Remote Control of marine propulsion plants, which typically consist of a combination of engine / propeller / gearbox / clutch sub-assemblies. Remote Control is done from bridge level (WH Fwd, WH Aft, Port side wing or Stbd side wing). To achieve this, the levers are equipped with signal transmitters for engine RPM, clutch direction etc. that are wired to the propulsion plant control system. Telegraph Systems In case the Remote Control (RC) system is out of order, a switch over to telegraph mode can be made. The same levers are now used to send telegraph commands from the wheelhouse to the engine control room (ECR) or engine room (ER), whichever is selected as the current reply position. An alarm will sound until the command has been acknowledged. The propulsion plant is now remotely controlled from the ECR- or ER levers, or manually in case the ER lever has no remote control transmitters. Electrical Shaft Systems The purpose of an electrical shaft system is to synchronize the operating levers of all control units connected, mostly on the main bridge and bridge wings. 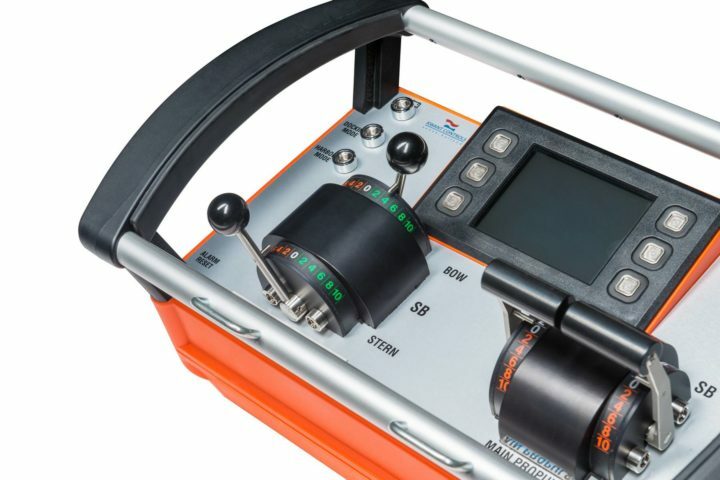 It enhances the ease of use and increases safety in emergency situations, since control can be taken directly from any of the operating positions connected. Synchronization enables switching of operating position without changing the control signals for propulsion and/or heading (bump-less take-over). A second advantage is that the transmitters providing these signals are required on just one of the control units, since all levers will move simultaneously. To achieve synchronization, the control units are equipped with servomotors. Electronic circuitry will take care of driving these motors, as well as handling the take-over requests. Take-over can be achieved by means of illuminated pushbuttons, or by potential free contacts from other systems. 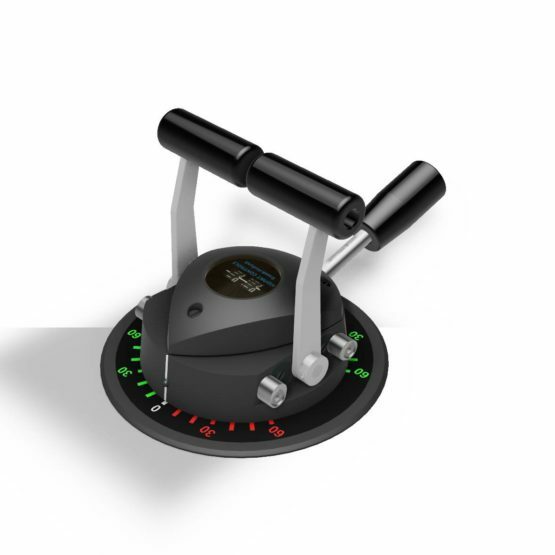 The Kwant Controls Nautical controls are typically part of the larger control system and its subsequent subsystems aboard vessels. Over the years Kwant Controls has developed modularized, smaller and larger control system concepts, in cooperation with world’s leading marine companies. For enhanced operations and safe control, according to class regulations. At early stage of the project, by functional specification the scope and system functions are defined. This forms basis for our engineering process towards full flush simulation tests at our in-house test-facility.